Ira Aldridge was born in New York but worked primarily in England doing Shakespeare. That the Brits would accept and embrace not only an American, but a Black American, performing their beloved Shakespeare, is a pretty amazing thing. His is a fascinating story, and this play tells one part of it. Namely, when Ira was brought in to take over the role of Othello after esteemed actor Edmund Kean dropped out due to illness in 1833 (although I'm not certain that part is historically accurate, but no matter). Although some in the theater are supportive, he faces great opposition from audience, critics, and fellow actors. The story is told as a flashback, bookended by an older Ira in 1867, now a successful actor, reminiscing about this pivotal and difficult moment in his life. Perhaps this life story is too big to tell in a two-hour play (a Netflix series would be fantastic), but I was left wanting to know more. How did Ira go from being panned by theater critics using horrible racial slurs, to having a successful career throughout Europe? How did he come to have a white servant who waited on him hand and foot and treated him like a son? What's the deal with his first wife, whom he seemed to love dearly, but with whom he had no children, instead having several with his long-time mistress whom he married after his first wife's death? But despite the lingering questions, the play includes discussions that feel like the ones we're having today. 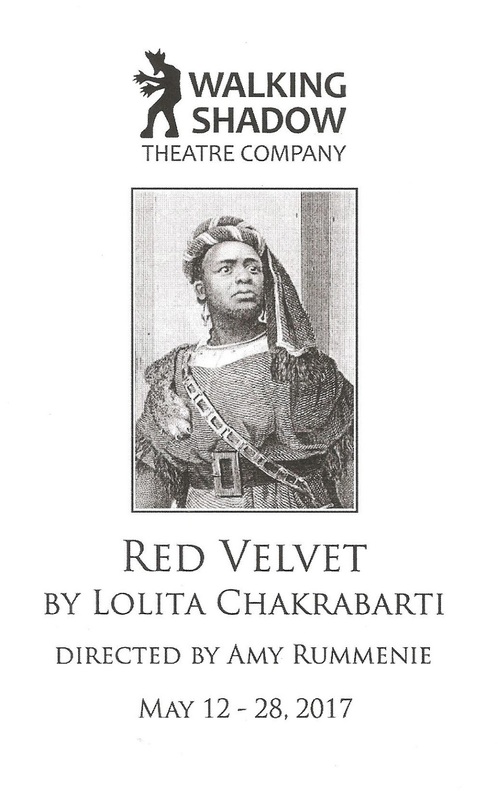 As director Amy Rummenie says in a note in the program, Red Velvet "addresses the current events of 1833 and 1867 and still talks directly to us in 2017. It's one thing to slip into the mindset of another character, but it requires another layer of intellectual and emotional acrobatics for the actors to look through the lens of history with a modern eye." Which is exactly what this excellent eight-person cast does. JuCoby Johnson, an actor who continues to impress on many stages around town, leads the cast as Ira, portraying both the young brash actor and the older world-weary one. The wonderful ensemble, many of whom play multiple characters with multiple accents, includes Andy Schnabel (the strong and kind Frenchman, Ira's friend), Bear Brummel (providing a bit of comic relief in two charming protrayals), Elizabeth Efteland (an elegant and intelligent performance), Kiara Jackson (saying much with few words), Michael Lee (almost unrecognizable in two very different roles), Sulia Rose Altenberg (playing three different roles with three different accents and three different wigs), and Ty Hudson (as the jerk we love to hate). The Southern Theater looks as gorgeous as always, or even more so, with a rich red velvet curtain draped across the arch. A few set pieces - a dressing room off to one side, a tea cart in one corner, a few elegant chairs - are all that's needed to set the scene (set design by Annie Henly). At the center of the play is the debate about art and politics. Should art be merely escapist entertainment (which some of Ira's colleagues thought wasn't possible when they went to the theater and saw a black man, during the time when the abolition of slavery was a hot topic)? Or is art, by its very nature, a social and political commentary on the world we live in? 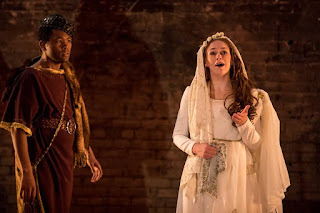 I think I've made it clear in many posts this year that I believe the latter, and judging by the excellent and important work being done in the Twin Cities theater scene right now, I'm not alone in that. 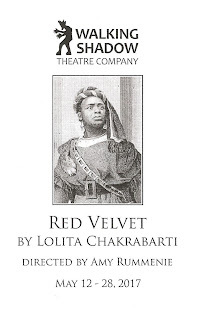 Red Velvet continues at the Southern Theater as part of their ARTshare program through May 28.